What happens when League of Legends pros start to stumble? Life's rough for the pros at the bottom of the ladder. Part of the allure of League of Legends' profession scene is seeing the game played at the absolute highest level. While the standard of play varies depending on the region (most people would argue that Korea’s LCK is a more skilled arena than North America’s LCS) people tend to tune into the broadcast with their favourite teams and players - and that tends to be local. At times, being a pro League fan can be beautiful. You come together with other fans of your team, you cheer over the good plays, lament over the bad ones, but ultimately hope that the players you love do well and succeed. At least, that’s how it should work in theory. Sometimes, though, fans get frustrated. They get upset when they see a top laner dive too deep and throw the game, a jungler fail to gank, or a bot lane give up those early kills. Sometimes, it’s bizarrely hilarious to see a bad play, like the infamous quadra execute between Renegades and Team Dignitas. Other times, fans get blood pumpingly, heart poundingly mad. In an age where anyone with any level of celebrity has never been more accessible, it’s incredibly easy to let someone know what you think of their performance. So, what happens when fans do exactly just that, week after week, and with less than kind intentions? There are a lot of positive things about being a pro. You have fans who look up to you, a regular salary, and of course you get to say you’re living the dream. After however many years of playing solo queue or the Challenger circuit, you’ve made it. Of course, it’s not an easy deal. For every superstar who’s making massive sponsorship deals and is showered with love and chants, there’s a workhorse who keeps their head down and does their job and turns in perfectly respectable results game after game. Then there are the players who get styled on. While some players get MVP rewards and interviews, some players get a flood of negative comments. Every player has entered into an agreement with the public. They serve up performances, and in exchange, they get a response. There’s a non-zero chance that you end up being the guy at the bottom of the role rankings with a note next to your face stating that you’re likely to get worse. You spend hours each day playing and getting better, and sometimes it doesn’t work out. Sometimes that’s on you, and sometimes you’re in an environment that’s wreaking havoc on you or your teammates disagree on how to handle things. You have to play with the hand you’re given until you can bow out, and you’re surrounded by people who are also in the pressure cooker and openly talk about their perfectionist qualities... and then there’s you, struggling to keep up. Not only might you be in this situation, but relegation means there’s a very real risk associated with playing badly. Every loss gets you closer to the bottom of the bracket, and the bottom of the bracket means your entire team could slip under into Challenger. If you’re on a team that gets relegated, you could be considered not worth a pickup. Your career, and an organization, could be on the line. It adds up, fast. In the past, pros have admitted to effects on their mental health or self-esteem. Some pros are never really able to get back into the game; a bad experience on a team or during a season convinces them it's better to pursue another path. Some teams had toxic environments in the team houses. Players would live together, play together, and fight together. While everyone is working on creating a healthier environment for pros, these tense team houses had a very real effect on players and we’re not immune to having those issues pop up again. It takes about fifteen seconds to write a tweet and you can fill it with as much nastiness as you can fit into 140 characters. Reddit offers weekly threads on the games, and people upvote good burns and quick witted memes, not thoughtful and empathetic comments about how a player must be feeling or an analytical look at their play. When one person dumps on you, it becomes very easy for everyone to start dumping on you to get that easy karma. Huni picked Lucian top in a playoff match against Team SoloMid nearly a year ago and people still bring that up to this day. Huni’s a player people like, but it became so seductive, so easy to fall in love with the idea of the relentless goofy carry top who sunk his team’s chances. When we reduce players to memes, we circulate these jokes. Sometimes these jokes and memes are harmless, sometimes they get a little meaner. Fans will jab at a player’s weight, at their history, at their face, at the way they talk. If your jokes get removed from Reddit, you can take them to Twitter, or spam them in Twitch chat. There have been times where players bow out under the pressure or admit to hellish conditions, and people will feel bad in the moment, but when a new sacrificial lamb is served up the train starts again. Part of this is simply that the internet is the internet, and you have to deal with that. It’s unfortunate, but there’s no way to turn back the tide on internet culture or stop up a source of memes. Teams, however, are being proactive about helping their players. Over the years, teams are amassing more infrastructure and staff. That can mean psychologists and coaches who help players with both their in-game improvement and their out of game tenacity. When you take a bunch of young adults, and put them into a career that comes with financial independence and fame, it’s not a surprise that there are some hurdles along the way. 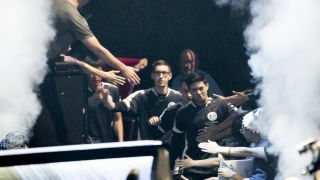 It’s important to build a sustainable and ethical environment for pro League of Legends, and if pros are burning out every year because they can’t take the emotional pressure, that’s not ideal. Some people aren’t suited for the lifestyle, but to reference a famous metaphor, they should be able to step out of the kitchen without the threat of being engulfed by flames.